Wood rot, mold, mildew, and insect infiltration in foundation spaces cost home-owners millions of dollars every year in structural repairs. 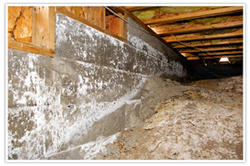 Controlling the moisture in your crawlspace is the most effective way to prevent these issues. According to the EPA, the way to control mold is to control moisture. Moisture can also create an environment that attracts insect populations as well as contribute to conditions that cause mold, mildew, wood decay, and unhealthy air quality. Conditions that often go unnoticed by homeowners until it’s too late. 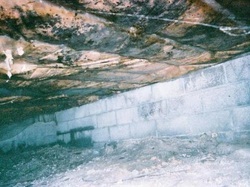 Vented crawlspaces can deal with moisture and biological contamination problems better than non-vented spaces. Vented crawlspaces have been successfully used for moisture control for over 65 years. The introduction of powered foundation vents has brought the practice into the 21st century. Powered foundation vents are installed on one side of the foundation with open, non-powered vents on the other side to create a flow of air through the crawlspace. Feelsecure Pest Control has been successfully using foundation vents for years to help our clients control moisture underneath their homes. We have perfected a high quality Extraction system, from 3 different companies to extract high volumes of bad air and moisture from your sub floor..
​A wind driven, roof mounted, aluminium ventilator designed to exhaust heat & moisture from the roof space of a home, without the use of electrical energy.The high quality, roof mounted, aluminium ventilator combines classic design with high tech features for guaranteed long lasting performance. Whirlybirds is a wind driven turbine ventilator designed to exhaust heat & moisture from the roof space of a home, without the use or electrical energy. Constructed from light-weight aluminium, it comes with a 15 year warranty for long lasting peace of mind and comfort in your home. These whirlybirds have high quality steel ball bearing so they last a long time. We also deliver and install dehumidifiers. These are high quality Dehumidifiers for rooms and wardrobes.